In this exhibition of silk screen prints Northwest Coast artist Preston Singletary draws on his Tlingit tribal heritage to explore themes of transformation, nature and myth. Preston Singletary is internationally recognised for his bold depictions of birds, animals and humans in the distinctive style of the Pacific North West. Early on in his artistic career, Singletary translated these designs into extraordinary three dimensional glass sculptures, establishing his reputation as the pioneer of contemporary Native American Indian glass art. This exhibition focuses on his two dimensional, Limited Edition, original serigraph prints. Many of these vivid Fine Art Prints are ultimately destined to be transposed into Singletary’s unique hand-blown, sandblasted glass sculptures. His iconic aesthetic, characterised by undulating lines and emphatic motifs, finds eloquent expression in both art forms. I’m like the shaman on the Northwest Coast. They didn’t choose to be shamans necessarily, it was something that happened to them, that chose them to do their work of healing or seeing visions, of helping their group or their clan. In some ways I equate that with what I do. In my case, I want to bring the Northwest Coast art perspective into a new dimension and new level of recognition. It’s important to me that I represent us well as people. It’s a burden in some ways, but it is also an honour. Singletary balances a profound interest in Surrealist and other modern and contemporary art movements with a keen observation of the stylistic traditions of his ancestors. Through his astute visual analysis of pre-existing carved tribal objects, such as totems and bentwood boxes, Singletary is able to simultaneously honour and innovate his cultural traditions, and pay homage to the ‘formline’ style of Pacific North West Coast art. ‘Formline’ design is a technique of creating an infinite visual vocabulary from repeated ovoid, ‘L’ and ‘U’ shapes, and expanding and compressing these elements to create new representations. Singletary’s masterful grasp of ‘formline’ design has resulted in rhythmic compositions where Tlingit myths and fables reverberate from the surface like the beat of a drum. Creatures from the bird and animal kingdom have a fundamental role in Tlingit tribal narratives. Many of the symbols and emblems of the Tlingit culture are owned by specific families. My family is Killer Whale so I have the right to display that particular emblem and the symbols that belong to my family. Because we are the Eagle clan we also have the wolf symbol that sort of represents our family. Then there is the Killer Whale and the Brown Bear, so those are the symbols that actually belong to my family. 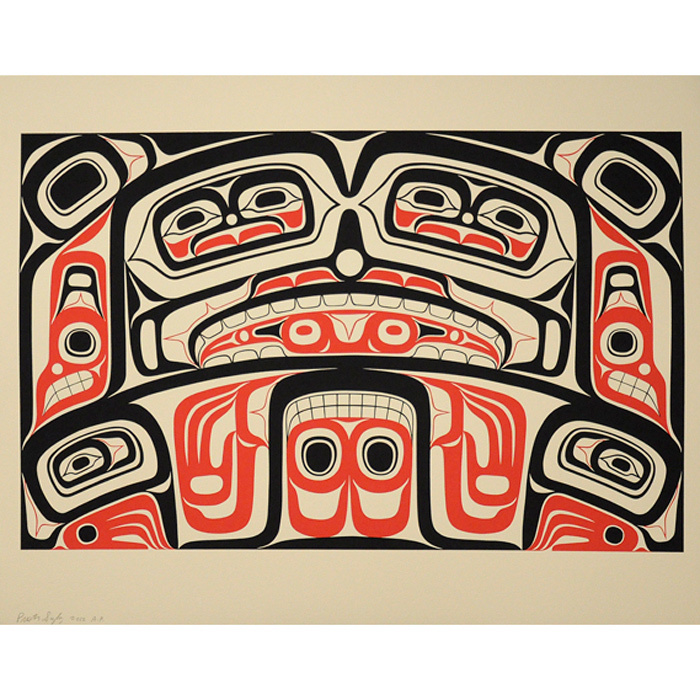 The origin myth of the Tlingit centers on the trickster Raven, who brings the sun, moon and stars into being, explaining the prominence of the bird in these pieces. Designs are composed by deconstructing the parts of an animal and then creatively rearranging various elements to reveal a composite image. Separate symbols within the depiction allude to episodes from myths, conveying tribal metaphors and multiple, interconnected narratives. Transformation is a recurring theme in Tlingit mythology, and Singletary’s mesmeric compositions convey the fluid metamorphosis and affinity between human and animal spirits.